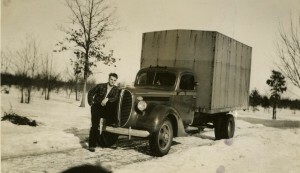 The 1934 Cooley Bridge project marked the creation of what is now known as Howes & Howes Trucking, Inc. Gene Howes, founder of Gene Howes, Inc. which gave way to Howes & Howes Trucking, bought his first truck – a 1935 Dodge – to haul to and from the paving of M-55 on Cooley Bridge. That was back in 1936, the same year that he wrecked his Dodge and bought a 1936 Ford dump truck that became the basis of his work. Gene took a break from the trucking business to work with his brother in the lumber industry for the next few years. That led to his next trucking plan – hauling pulpwood during the lumbering years of the 1950’s. At that point, Gene Howes, Inc. was thriving in Kaleva, Michigan. Together with his son Roland, in 1961 Gene formed Howes & Howes Trucking, Inc., a gravel hauling business with three trucks. The company gradually grew to be much larger and in 1970, a second location opened in Ellsworth, Michigan. As growth continued, the company outgrew its location in Kaleva and relocated its main office to Mesick, Michigan, where it still flourishes today.